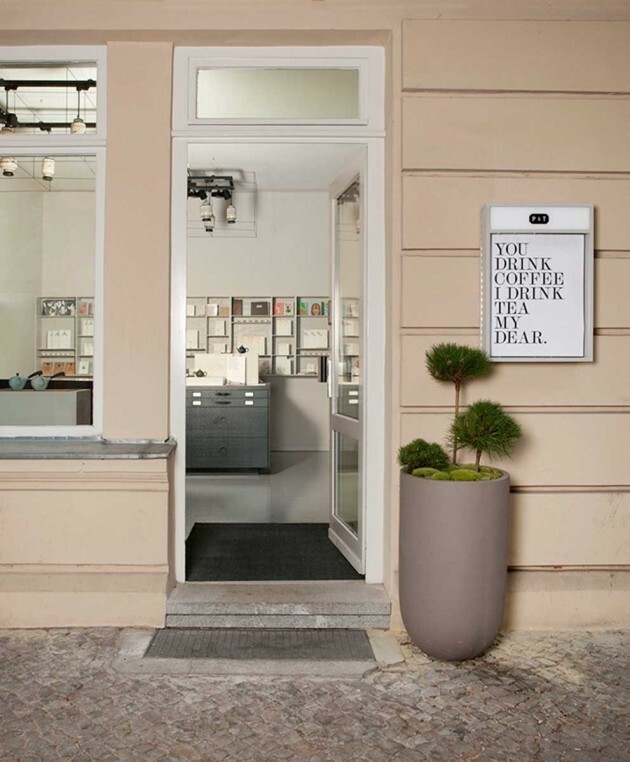 Fabian von Ferrari has designed the interiors for P & T, a specialty tea company in Berlin, Germany. 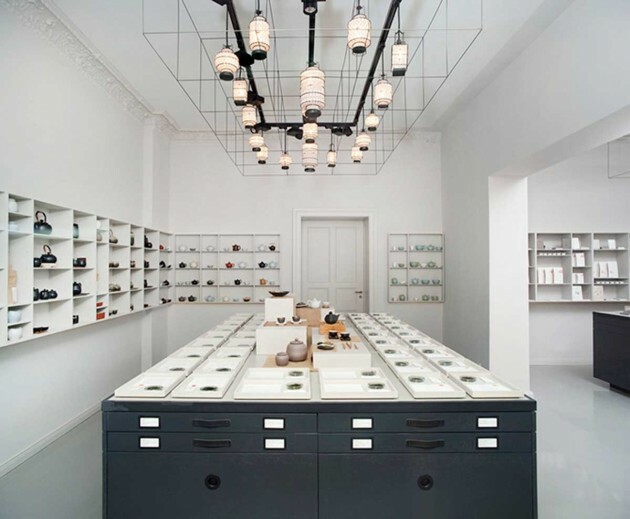 P & T’s mission is to make fine teas and tea culture more accessible and rewarding to a broader audience. 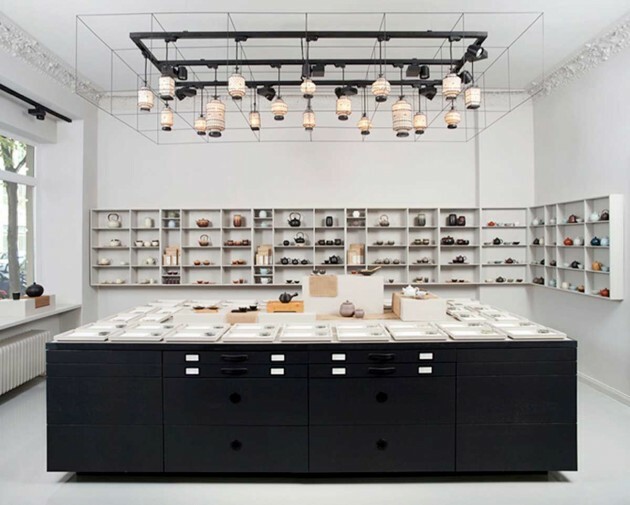 On freestanding presentation cubes outfitted with sliding drawers the individual teas are displayed in a practical fashion with accompanying information, logically organized according to their degree of oxidation. Leaving the conventional `apothecary´ over the counter mold behind, customers are invited to smell the individual teas on display, read about their origins, production processes and their tasting characteristics or sample a particular tea, expertly brewed and served by a ‘teaist’ at one of the tea tasting stations in the Chinese and Taiwanese style of Gong-Fu. 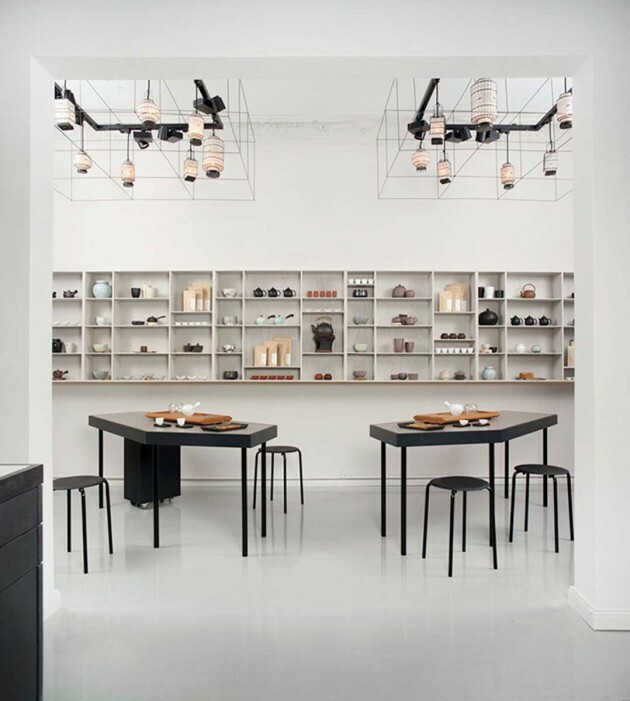 This also spatially sets up the presentation of tea in the center while accessories are providing the backdrop, placed in wall shelves and lined up to form a continuous belt tying all rooms together. The presentation cubes are accompagnied by light wire frames that host the functional lightning and swarms of traditional chinese lanterns which give the installation a poetic note. By responding to the cubic furniture in the 3rd dimension these frames put once more the focus on the laid out teas and objects. Chinese five-elements-theory has influenced the choice of colors, which links water, the basic element for brewing tea, to black and the minerals it contains to white. All colors range between these extreme poles in shades of grey and employ a quiet environment that stands aside, allowing the tender colors of the natural tea leaves and the bright colored glazing of the accessories to speak for itself.